The Million Air/CJet FBO at Beijing Capital Airport will receive a larger sibling, when the joint venture opens its second location next year at Daxing International Airport. With Beijing’s new Daxing International Airport (ICAO code ZBAD) due to debut in September, Million Air Beijing, the joint venture between the U.S.-based FBO chain and Capital Jet (CJet), is currently at work on what will become its new flagship facility, which it expects to open in summer 2020, as a second general aviation (GA) access point to Beijing. 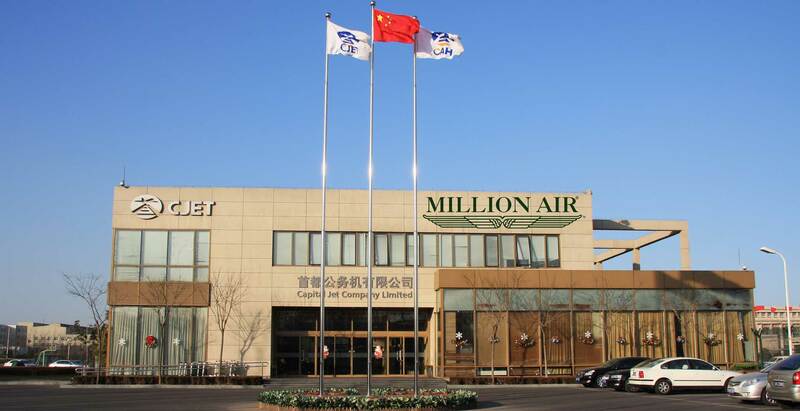 Million Air/CJet (Booth B212) opened its first facility at Beijing Capital Airport (ZBAA), one of the world’s busiest, in January 2016, and serves as the lone FBO there, handling all the GA traffic into the city. Indeed, the company claims a domestic market share of more than 60 percent of all business aviation traffic within mainland China. The location, which expects to achieve Stage 1 registration under the International Business Aviation Council’s (IBAC) International Standard for Business Aviation Handling (IS-BAH) soon, averages about 47 arrivals a day, according to John Bridi, Million Air’s vice president of international operations. “A strong market is coming from the U.S. in N-registered tail numbers, and also we have seen a strong increase in head-of-state flights from foreign countries.” Given the facility has 50 GA parking stands, distributed across five ramps, that translates to near capacity every day. As a comparison, the under-construction FBO at Daxing will have more than 90 parking stands, all consolidated on the dedicated general aviation ramp adjacent to the private aviation terminal. Of those stands, more than half will allow aircraft to taxi in and out of their spots under their own power, while the remaining stands will require tugs to push them in. “It will operate more like a North American ramp, where you don’t need ground clearance to move the aircraft a couple of spots over,” said Bridi, noting that this freedom will help streamline the GA operations at the new airport. “A lot of the hiccups that we’ve had at [Beijing Capital Airport], we’ve been able to design around for Daxing to make those go away.” The new airport will also have eight stands that can accommodate Boeing Business Jet (BBJ) or Airbus Corporate Jet (ACJ)-sized aircraft compared with just two at Beijing Capital. In addition, the FBO at Daxing will have two stands to handle private aircraft up to Boeing 747 or Airbus A350 sized aircraft, which the FBO at ZBAA cannot accommodate. Those lessons learned at Beijing Capital Airport are being applied at Daxing in a big way. Despite the high demand for aircraft shelter, the former has no dedicated hangar space for private aviation, leaving the FBO to form relationships with some of the airport’s maintenance providers to locate available space for its customers in the maintenance hangars. At Daxing, however, current plans call for more than 700,000 sq ft of dedicated general aviation hangar space, enough to accommodate 20 Gulfstream G650s, along with a 75,000 sq ft maintenance facility.